Downloading data provides a way for you to quickly download Look or Dashboard data to the computer you’re currently using to access Customer Insights data: you cannot download data to a different computer/storage location. In fact, you can’t even specify a different folder: when you download data it automatically gets stored in your browser’s assigned downloads folder. Admittedly, that limits your options a bit. On the other hand, it makes for a very quick, very easy way to download data for yourself. And that’s exactly what the feature is intended to do. 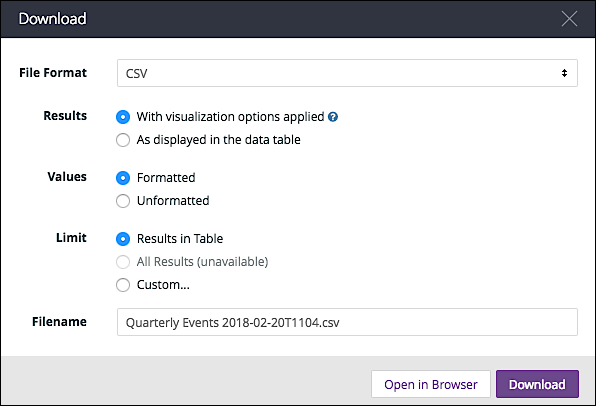 Dashboards provide two options for downloading data: you can download the dashboard as .PDF file (which gives you a read-only replica of the dashboard) or you can download the data as a set of CSV (comma-separated values) files, one file for each visualization on the dashboard. TXT (tab-separated values). Plain text file with data fields separated by using tabs. Excel Spreadsheet (Excel 2007 or later). The downloaded file includes the raw data but does not include any visualizations options such as row color. CSV. Plain text file with data fields separated by using commas. If a field contains a comma (for example, January 1, 2018) that field will be enclosed in double quote marks: “January 1, 2018”. HTML. Data is downloaded as an HTML file, formatted to match the format of the visualization. Markdown. Data is downloaded as an unformatted table using the Markdown markup language. PNG (Image of Visualization). The download consists of a “snapshot” of the visualization. Data can be viewed but cannot be manipulated. As displayed in the data table: Data is returned without applying visualization settings. This typically applies to table calculations. Results in Table. The downloaded file contains the same number of rows specified in your Look. If the Look only allows 300 rows the downloaded file will only include 300 rows. All Results. Returns all the rows returned by the query; this will often be more rows than specified by the Look. Note that the All Results will not be available depending on such things as the size and complexity of the query, and whether the query includes “add-ons” like row totals or table calculations. This option should be selected only if you are sure that the resulting download will not tie up the network and/or your local computer. Custom … Enables users to specify the number of rows they can return. Depending on your user account permissions, the maximum number of rows will either be 5,000 or 100,000. Multiple Explores in a Single Look is the name of the Look. 2018-02-05T1106 is the date and time that the file was downloaded (February 5, 2018 at 11:06 AM). .csv indicates that the file was saved as a comma-separated values file. You can change the file name if you want. However, you cannot change the download destination: files are automatically downloaded to the downloads folder specified for your web browser. Open in Browser. When selected, the file is not downloaded to your computer but, instead, is opened in your web browser. Excel spreadsheet files cannot be opened in the browser. Download. When selected, the file is downloaded to your computer.